Click the Publish To My Favorites button to add an entry to your Public Favorites Page. This will add that entry to your Public Favorites page so you can then easily share it with friends. To view your public favorites, click on the "My Public Favorites" link at the top of the page. All of your favorites are organized by destination, and each destination has its own page listing all of the entries that you've published. Click on an entry to drill in and view more information about that place. There you can add your own notes and edit its details (but the changes you make won't be reflected back in your original trip). Once you've got some favorites published, it's easy to share them with friends. Just copy the URL from your browser's location bar and paste it into an email. When your friends get the link they can browse all of your favorites with no signup required. 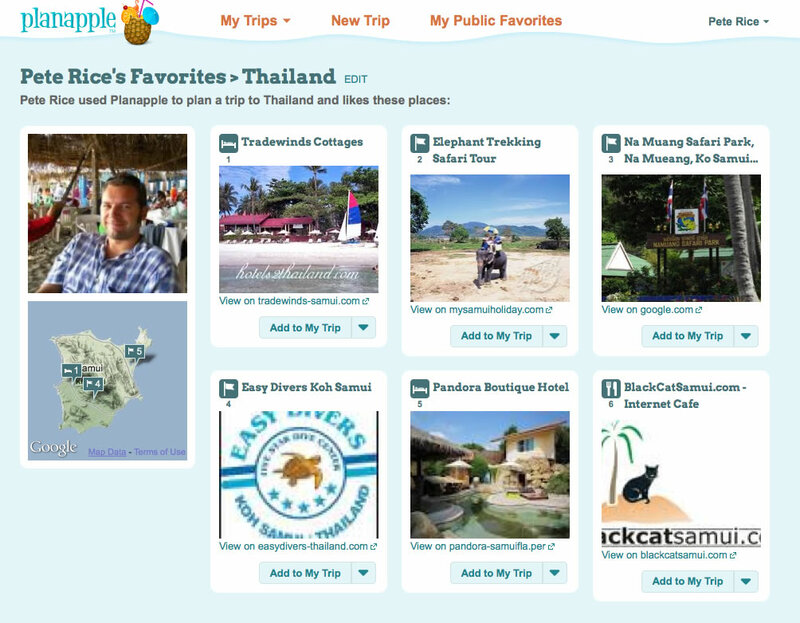 They can even start planning their own trip on Planapple by clicking on the "Add to My Favorites" button under any entry! We hope you find this new feature handy next time someone asks you about a trip. As always please feel free to share your thoughts with us via the "Feedback" tab on the right. We'd love to know what you think of the new feature and how we can improve it.